2014 was a very VERY tricky year. Sandwiched between several nasty train-wreck events, some amazing things managed to happen … things that are enduring and that have set this new amazing year in motion. I love that my mind (without even being asked) has been busily walling the darkest ickiest stuff of last year into the furthest (farthest?) recesses of my mind … burying those memories deep within layers of cerebral plaster so thick that I soon won’t be able to get at them even if I try … won’t be able to recall all of those tiny little and unfucking believably huge things that threatened to atrophy my emotional cardiovascular system … things that made my lungs feel like they were filling with cement so that I could barely breathe … things that brought my heart more dangerously close to flatline than it has ever been. The whitewashing process that is currently underway will wipe everything clean so that I have a fresh canvass upon which to paint my retrospective of the past twelve months. I think I’ll use lots of reds and oranges and yellows and pinks and silver glitter and liquid black. The grey and oppressive purple shades can stay off the canvas. I feel pretty done with it … like I don’t want to give it even another second of my attention. So it will probably remain pretty much as it is now. When I look back years from now I may pause and wonder about the blank spots that lack detail and definition, but they will not capture my attention for long. I already feel like a whole new painting has begun to emerge. 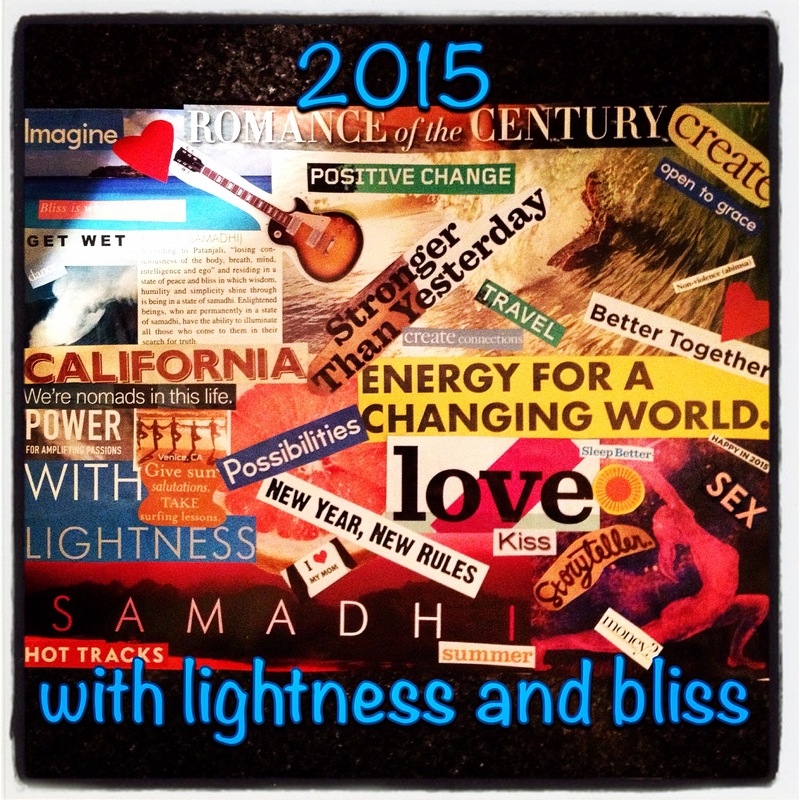 In no particular order 2015 will include kissing and california and creativity and strength and connection. It will specifically include surfing lessons, tattoos, sleeping better, and lots of music. It will generally include samudra, ananda, laghima, samadhi, and other stuff that sounds way more magical when you say it in sanskrit than in english. PS … read this Huffington Post article from Dec 2013 (12 Illuminating Sanskrit Words) and you can make up stuff too. It’s more fun to set goals, visions, and intentions in sanskrit. For real. Give it a try.